Med tv:n monterad i en TV SHIELD kan den sitta var som helst, väder, vind eller annan form av yttre påverkan gör inget. Den är dessutom näst intill vandalsäker. Fronten är tillverkad i LExan som är ett av de hårdaste genomskinliga material som finns. Används bland annat i båtrutor. 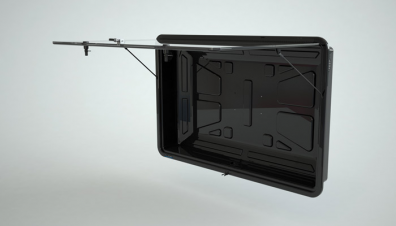 The TV Shield is a water, dust, and tamper proof LCD, LED, PLASMA TV enclosure that offers protection for TVs from 50 inches, to 55 inches up to 60 inch in some TVs. Providing the ultimate in protection for your TV, and includes a clear LEXAN plastic front panel that provides an optically clear view of your TV or flat panel display when closed, and when opened will give you a direct view of your TV or display. - Outdoor entertainment areas, decks, around the pool etc. - Protect from flying WII remotes, clumsy children etc.